An adult-roleplaying-as-a-child romantic comedy, Too Young To Kiss features an edgy June Allyson performance but also veers close to plenty of icky behaviour. In New York City, Eric Wainwright (Van Johnson) is a womanizing and successful talent promoter besieged by wannabe performers. Cynthia Potter (Allyson) is a frustrated aspiring concert pianist, refusing to give up on her dream but unable to get Wainwright's attention. Her boyfriend John (Gig Young), a newspaperman, urges her to quit, but instead Cynthia gatecrashes a children's audition evening by pretending to be 12 year old Molly, Cynthia's younger sister. Wainwright is stunned by Molly's precocious talent, and Cynthia cannot bring herself to tell him the truth. Eric books a high-profile concert for Molly and takes over the girl's life, parking her at his country estate and helping her practice to be a success. Cynthia is bitter that Eric thinks the world of Molly but cannot appreciate Cynthia, and proceeds to try and make his life a living hell. Similar to other woman-having-to-pretend to-be-a-girl efforts from the era such as The Major And The Minor, Too Young Kiss is both more disconcerting and more fractious than the typical rom-com. 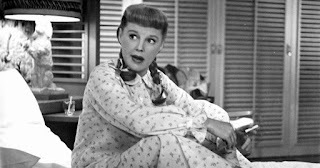 Whether intentional or not, the film carries a welcome undertone of anger, with June Allyson's Cynthia seething for long stretches at the injustice of an entertainment world where her talent is celebrated as a child and ignored as an adult. Her revenge is to poke away at Eric's comfortable life as a Svengali. Director Robert Z. Leonard, again perhaps inadvertently, steers towards uncomfortable territory in portraying Eric's dominating behaviour towards Molly. He is frequently leading her by the arm, approaching her too close, tucking her too tight, his actions bordering on a version of kidnapping and culminating in a spanking episode. Cynthia-as-Molly displays her disgust and annoyance, and pushes back with vexatious actions of her own, giving the film a pointy stance. But this is ultimately a romantic comedy, and inevitably all obstacles and misunderstandings shall be overcome in order for the happy couple to find each other. This being the fourth of five teamings between Allyson and Johnson, their fans expected nothing else, and the script finds its way towards an awkward climax to unite them. Along the way there are plenty of piano interludes, and Allyson is game in pounding away at the keyboards, never quite in synch with the advanced music. She was 33 at the time of filming, playing a 22 year old character impersonating a 12 year old girl. Her performance as Molly is more than passable, while Johnson stays within himself as suave and confident romantic interest. Gig Young is the unfortunate other man, getting regularly punched for his troubles. Too Young To Kiss raises issues about the nature of talent, the treatment of women and twists of career fortune. The film may have been intended a flighty teaming of a popular screen couple, but it contains more talking points than expected.